Welcome to Costa Rica! We will meet you at the San Jose International Airport. Your private transfer will take you North (3.5 hours) to the spectacular Arenal Volcano area. 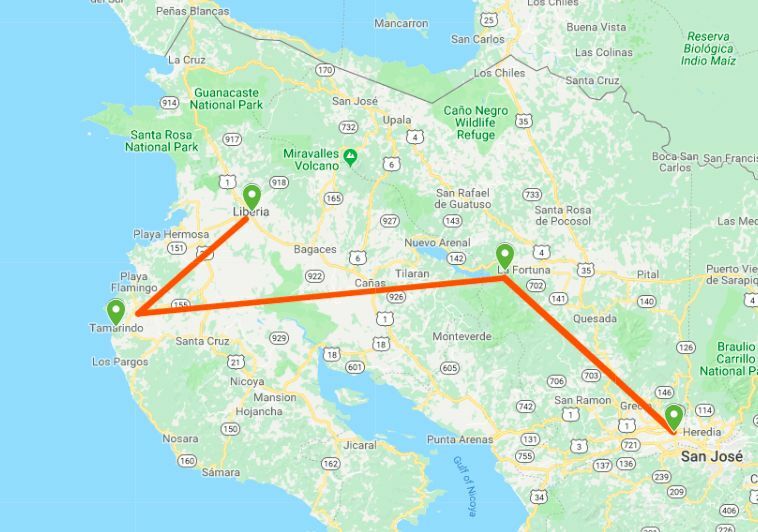 You will leave the city behind and find yourselves traveling through small towns and rolling green hills, through the cloud forest of San Ramon, to the Caribbean Lowlands of Arenal. The Observatory Lodge has a huge observation deck overlooking the Arenal Volcano and an expansive garden. There is a total of 870 acres of forest and an excellent trail system. This is the premier bird watching location in the Arenal area. After breakfast at the Observatory Lodge you will spend the morning at the Arenal Hanging bridges this gives you a unique chance to see the canopy at eye level. Today after breakfast it’s time to move on to the incredible beaches of Guanacaste. You will have time for a leisurely breakfast and then your driver will arrive to transfer you (about 4 hours) to Tamarindo for check-in at your hotel. Enjoy a day at leisure or plan for an optional tour. Be sure to explore the local restaurants. This area is well known for great food. Today you will head out before sunrise to a private reserve to spot some of the area’s most prized species. In the early morning light, you will spend over 2 hours in the forests of Cartagena or Camaronal. Keep your eyes peeled and binoculars ready: you might be able to spot the Jabiru, a giant bird family of endangered storks with Guanacaste as only one of their remaining homes; the Elegant Trogon, Laughing Falcon; Squirrel Cuckoo, White-Throated Magpie Jay or the Cattle Egret. The cool temperatures of the morning will maximize your chances to view these species as this is when they are most active. Your experienced guide will lead you to ideal locations and use a guidebook to help you identify the many species that surround you. Enjoy this day at leisure or plan for a sunset sailing tour. You can experience the best sunset on board a small catamaran style boat. Enjoy the incredible view of Costa Rica’s wonderful coast. With a tropical cocktail in hand, you will sit on the prow gazing the sea in search of dolphins, sea turtles, birds etc. The boat will stop to allow some time for snorkeling. Today it’s time to bid farewell to Paradise. Your driver will arrive to transfer you to the Liberia International Airport (1 hr. 15 mins.) for your flight home.